This post was originally published on March 4, 2015 and was a central focus of my Ditch the Junk for Lent Challenge- 40 Days to a Better Me. If you’re still with me for the Ditch the Junk for Lent Challenge, welcome to Week 3! The first two weeks focused on healthier eating by ditching the junk food and reducing sugar intake. Now, for my next focus area, I’m moving on to clutter and organization. If you recall, I have three areas that I’m focusing on (Detoxify, Destress, and Declutter). 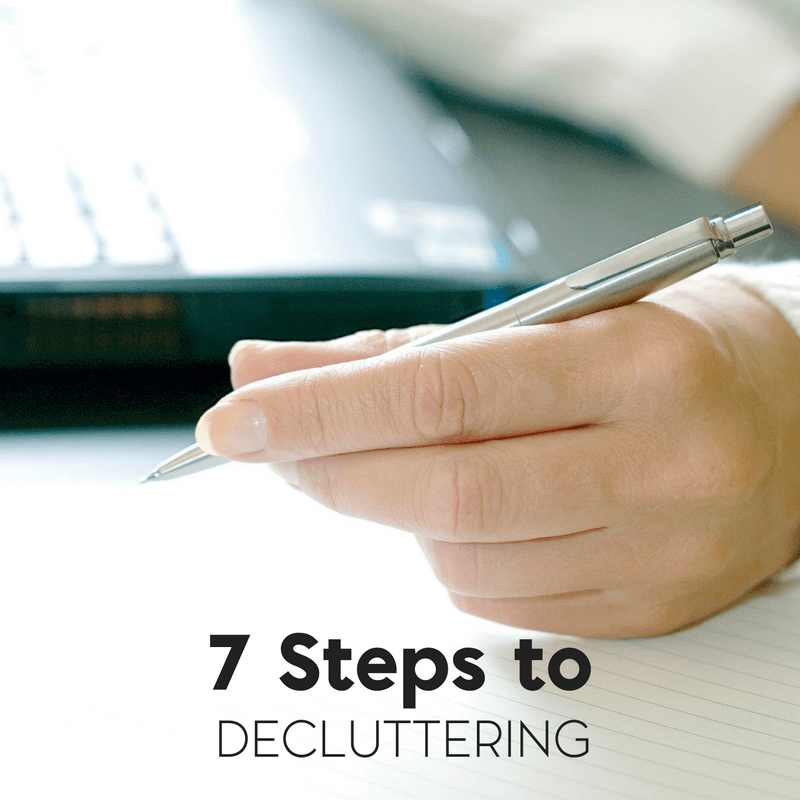 Today, I want to share with you 7 steps to decluttering and how to start letting go. For me, this is a huge problem. Both Kyle and I are very sentimental people and well, I’ll be completely honest- we’re borderline pack rats when it comes to stuff. But I also know that there comes a point when it’s time to let go. Since I started blogging, I’ve been able to do quite a few things and I’ve also accumulated quite a bit of stuff. Sometimes this stuff has taken over various corners of the house. I know that it bothers Kyle to an extent but together we tackle the problem. Around this time last year, one of those areas looked like a small disaster had occurred. That’s why I’m wanting to make decluttering a focus area for my own challenge. So, what exactly is decluttering? Is it just cleaning and organizing? Well, yes. To put it simply, that’s what it is. The term “decluttering” has been a catch phrase for a number of years. Some think it is simply cleaning a house, but if you have seen television shows about hoarding or cleaning, you know it can be much more than that. So, what does it entail? 1. Get rid of the current clutter you have in your home. 2. Avoid letting additional clutter into your home. 1. Start small when you begin decluttering. If your home is cluttered, going through and getting rid of things will seem intimidating. It is easy to become discouraged and overwhelmed. By starting small, even with one single dresser drawer, you see how much you can accomplish in a short amount of time. Quite often, with a small area, you can declutter and clean it in less than 15 minutes. Anyone can do this if is important to them. 2. Enlist the help of someone you trust. Perhaps your family is full of clutter bugs and they really are not interested in moving out of CHAOS (Can’t Have Anyone Over Syndrome). If they will not help you, ask a friend to do it instead. Not only will your friend be there to give encouragement, they may also be able to help you with the hard decisions that often come up when deluttering. 3. Get four boxes – Keep (this room), Toss, Donate/Give/Sell, and Keep (store elsewhere) – and place them in the area where you will start. Try to handle each item only once. When you pick something up, decide if you will keep it in the room where it now is; if it is garbage and can be tossed; if you no longer need it and it can be donated or given; or if it is to be kept in a different location. Look at each item and put it one of the boxes. Of course, you might think that this will create problems in the long run if you decide to store it elsewhere, but you can always perform another assessment. 4. When you review each item, try to think about how often you have used it in the last year. Be honest with yourself. If the item has not been used in a year, it is time to let it go – either in the trashcan or into the Donate box so someone else can use out of it. For instance, in the front entry way, there are several toys that Squeaker doesn’t play with anymore. It’s just a matter of sorting through them. 5. Be aware of the things you bring into your home. Quickly go through your mail outside near the garbage can. Important mail goes under your elbow. Everything else is probably junk mail and does not need to enter the house. While you open your mail, write down important dates on a calendar. You can then file the mail if still needed or shred it if it has personal information on it. 6. Adopt the one in/one out rule. If you purchase a new item, with this rule, you would also get rid of one item. This item could be something related to what you purchased or something non-related. The point is to get into the habit of removing one item each time a new item comes into the home. 7. When you have one drawer, stack, corner or box cleaned out, take a break. If your friend is still there, have a cup of coffee or tea. Then, after your drink is finished, tackle another. Before you know it, you will have a cleaned out dresser, cabinet or one less pile to look at. Then, do your best to keep that renewed area clean and clear from that point forward. 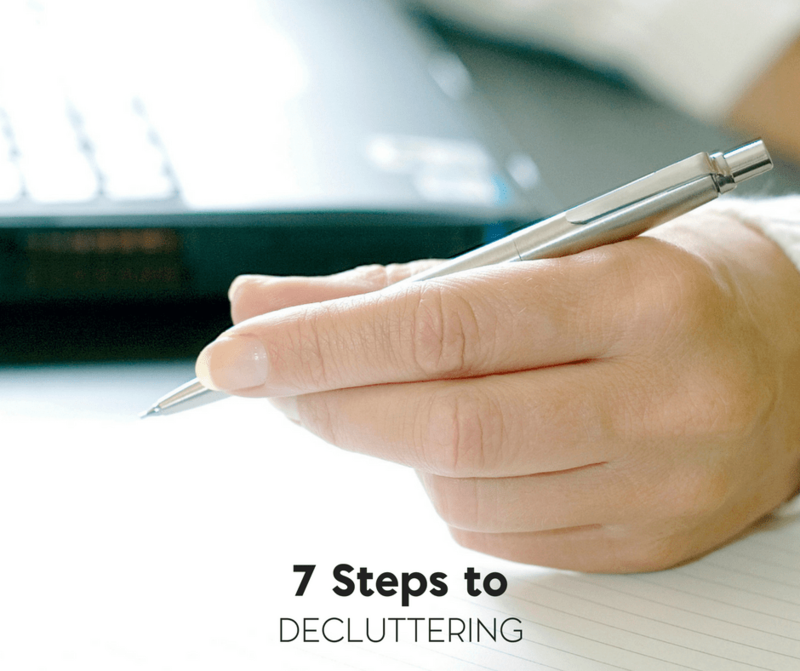 So, that’s 7 steps to getting started with decluttering, but when you’re doing your room by room sweep and come across that stack of children’s artwork, family photos, or trinkets… what do you do then? I’ve saved almost every piece of artwork and worksheet that’s been sent home with Sweet B since she was in preschool. Mind you, she’s 13 now so that’s 10 years (give or take) of paperwork. I also have Valentine’s Day cards from when I was in elementary school. My point is- I can’t always let it go. Well, first I have to ask myself- who am I saving this for? And then, I have to ask myself, is there another way to save it? For example, with Sweet B’s stuff, I can pick out the best of the best and make portfolios using a three ring binder and page protectors. The pictures will eventually go into frames or a photo album. Or, when my crafty side gets itchy, I’ll finally get my scrapbooks together. If you are having a hard time letting go of anything, take a hard look at all you have. This may sound like a strange exercise, but think about the items that you would miss if you lost your home to a natural disaster. If you could easily replace all but a few things, keep only those items that are most important. I’m so glad to have found this post- I REALLY need to start decluttering because it’s taking over our home and I don’t want our daughter growing up in that. I’m such a pack rat and have a hard time letting anything go, but these are some excellent points to think about. I stopped by from Women with Intention Wednesdays. We have a lot of issues with that too, believe me! But I’m in the same boat, I don’t want my youngest growing up in that either. Thank you for stopping by! Great tips!! Thank you so much for sharing at Works for Me Wednesday!! Love the tip about starting small. I have to do that. I have a short attention span and can get overwhelmed when I have a HUGE project in front of me. 15 minutes at a time is good, and I often use that technique when writing, too. I like number 6. Also, if I have not worn an item of clothing within one year, I take it to consignment or give to charity. Thank for the tips! I am working on decluttering for Lent…unofficially a 40 Bags in 40 Days. I hauled off 8 bags to charity and have 2 to go to a family at church as hand me downs. I really need to get this done. It’s been cluttering my mind for a while. 🙂 Thanks for linking up with Turn it Up Tuesday. I so needed to read this! I need to clean out my basement of toys and clothes!! The starting small is what I need to remember!! These are great tips! I am due to start spring cleaning and will keep all 7 in mind! I like the one in/one out rule. I do that with clothing. Expecially for clothing that I have sitting in my closet and I have not worn them in over a year. I love spring cleaning season when I purge all of the junk from the house! I use a similar system called L.O.V.E.